Dr. George Church, the legendary godfather of synthetic biology, just made another push towards massively editing life’s base code. Since the inception of gene editing, long before the CRISPR revolution, scientists have struggled with simultaneously altering multiple spots on a genome. This difficult feat, dubbed multiplex editing, challenges both scientists and their genomic toolkit: the edits have to precisely hone in on targeted spots in a genome while ignoring all non-targeted genes. There’s also the problem of efficacy: too few edits or edits on the wrong spot, and it does more harm than good. Too many, and the cells die outright. Yet the dream of recoding entire genomes is alive and gaining steam. Multiplex recoding is synthetic biology’s biggest next thing: like Neo gaining the ability to decipher the Matrix’s base code, the technologies will allow us to truly understand and tweak nature’s genetic code, trouncing evolution to “radically redesign” life. If that prospect sounds both exhilarating and terrifying, bioethicists agree. As scientists race to develop more tools to re-engineer life, others are exploring “safe modes” to molecularly block human-engineered mutants from spreading. Working with Dr. Kevin Esvelt at MIT, last week Church and others also introduced a “daisy-chain” CRISPR gene drive system that eventually limits itself in PNAS. For now, synthetic biology is mired in technological and ethical limitations. One way to overcome them? Make the tools better and include a “kill mode.” That’s what Church, Esvalt, and their colleagues tried to do. Church’s team isn’t the first to drastically alter a given genome. Back in 2013, Dr. Feng Zhang, one of CRISPR’s original inventors, engineered two different CRISPR-Cas systems to simultaneously edit multiple locations in mammalian cells. The system worked less than two percent of the time. Two years later, Church led a study to wipe out PERVs—viruses that tunneled into a pig’s genetic material—in pig cells throughout their genome. PERVs can hop over to humans, making them a nasty surprise for eventual pig-to-human organ transplants. The CRISPR tool efficiently mutated every single PERV gene, roughly 62 copies, in the pig’s cells. Then in 2017, a team led by Dr. Paul Thomas at the University of Adelaide wiped out the Y chromosome with CRISPR in mice. Church’s new work tackles one main problem: too many edits, and a cell commits suicide. Because classic CRISPR breaks the DNA double helix, too many snips can trigger the cell’s “destroy” mode to protect the body’s genome stability. In a paper posted on the pre-publication site bioRxiv, the team found that the key is tweaking base editor CRISPR: a relatively new flavor of the tool that doesn’t snip DNA, but rather swaps one genetic letter with another—for example, turning C and G pairings into T and As. The team engineered a bunch of these to target the “dark matter” of the genome: “jumping” genes littered throughout our DNA, with copies over 100,000 and counting. In two different types of human cells—one cancerous, the other induced pluripotent stem cells (iPSCs)—the team found that the base editors could trigger thousands to over 13,000 changes without killing the cells. iPSCs were more sensitive than their cancerous kin and allowed fewer genomic swaps. A birds-eye overview of the altered genome found few notable side-effects, and the edited cells survived for generations. “Overall I think this is definitely an interesting paper,” said Dr. Gaetan Burgio at the Australian National University, who was not involved in the study, to Singularity Hub. But he stressed that the paper didn’t fully examine on-target—in which CRISPR edited the target site multiple times—or off-target side effects. To Church, the study is another hop towards large-scale genome editing. He paints a lovely futuristic picture: genetically engineered cells that completely resist viral infections. CAR-T, the immunotherapy that supercharges the body’s own guardian immune cells to fight off cancer, could become more powerful and precise. We may even be able to transplant pig organs into humans, solving the persistent problem of organ shortage. Scientists could finally model the complex web of genetic changes in cancer or mental disorders, gaining insight into therapies. Or they could irrevocably alter a species—and pass those mutations down in a gene drive, overhauling the natural ecosphere. Here’s where stomping the brakes—or tapping “control+Z” comes in. Last week, Esvalt published a CRISPR-based system that essentially handcuffs the raw power of gene drives. Mention gene drives, and scientists shudder. 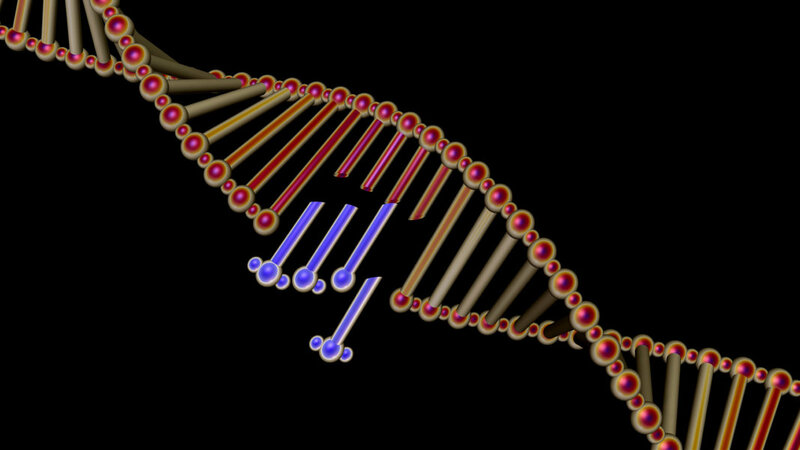 These engineered DNA codes can effectively “push” certain genetic traits down an inheritance line. Gene drives have the potential to wipe out or irrevocably change entire species. Scientists are already testing their use in disease-carrying mosquitoes. With gene drives, safeguards aren’t a hindrance—they’re a necessity. Esvalt’s idea is to “daisy chain” a series of genetic elements together, each depending on the next. One link encodes the CRISPR gene editing system. Others encode the “blood hounds” that tether CRISPR to a certain gene. Unlike classic gene drives that run wild in a genome, these daisy drives limit themselves in that they slowly lose the last link in the chain, which in turn hinders their ability to spread. “Imagine you have a chain of daisies, and at each generation you remove the one on the end. When you run out, the daisy chain drive stops,” said Esvelt. Estimates from the study suggest that a single genetically-engineered animal, equipped with a three-link daisy-drive system and released once every generation, can efficiently reprogram 100 wild counterparts in two generations. For engineering infertility into disease-carrying mosquitoes, that’s about a year. Normally, engineering a kill switch is self-defeating. But because CRISPR-based gene drives efficiently edit genes and pass the ability onto future generations, throttling the spread becomes a necessity for their use in the wild. Islands and other geographical isolations are likely the best places for initial tests, explained Church, who worked with Esvelt on the study. The daisy-chain mechanism offers a way to further limit the artificial evolutionary force of gene drives. With CRISPR gene drives rapidly maturing for re-coding genomes in mice and other rodents in the name of pest control, a molecular “emergency brake” becomes ever more essential. “If the world is to benefit from new gene-drive technologies, we need to be very confident that we can reverse it and contain it, both theoretically and via controlled tests,” noted Church. This simultaneous action of pressing the gas and pushing the brakes will likely characterize synthetic biology in the coming years. As genome recoding projects such as GP-write stimulate new technological breakthroughs to alter or construct genomes, others will try to contain the tools. But outright bans, such as the recent one tightening genome editing guidelines in humans, likely aren’t the answer. Even Dr. He Jiankui, who gained global notoriety last year by creating gene-edited babies using CRISPR, has his defenders—prominently, Church, who argued that the story is far more nuanced than that of an unhinged scientist climbing to fame. As scientists keep pushing to “extend the frontier of genome editing,” it pays to ponder: are there pitfalls ahead that we don’t even know about yet?